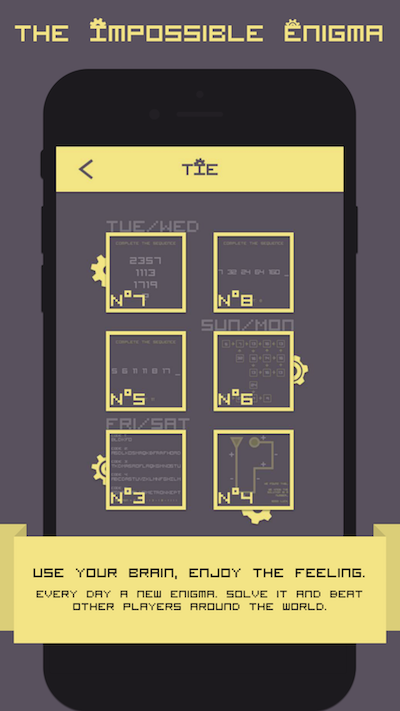 Welcome in TIE, the best logic game for your device. You can challenge yourself with a new enigma every day! Solve it and beat other players around the world. Use your brain, enjoy the feeling. We are really excited to introduce you The Impossible Enigma. We love casual logical games, with riddles that need a lot of focus and brain concentration. So we thought about a new app that renew the challenge every day with new really hard enigmas... and here we are! Every two days at 09:00 AM two new Enigmas will be published. By solving each puzzle you will earn some TIE Points depending on the difficulty. Your progress will be saved online and automatically updated. Any sensitive data will not be stored. Also, at 01:00 PM an hint will be unlocked for every new enigma, so you will get help if you have not come to the solution yet. You can read the hint and try to enter the solution in a "vintage" console. You can share any enigma with your friends through socials or instant messaging apps. You will get the Premium in-app purchase for free. Thanks! You will get the Premium in-app purchase for free and a grey t-shirt with the TIE logo. Thanks! You will get the Premium in-app purchase for free and a sweatshirt with the TIE logo. Thanks! You will get the Premium in-app purchase for free, a t-shirt and a sweatshirt with the TIE logo. Also you will get access on riddles preview! Thanks! We will publish 2 new enigmas every day. Thank you!